How to Buy a Roll-Off Dumpster that Contains Small Objects | Hambicki's Truck & Container Sales Inc. Imagine you were just awarded a large contract hauling wood chips from a manufacturing facility to a recycling plant in which wood chips are turned into energy. The contract stipulates that the hauler is responsible for hauling every last wood chip. Not a single piece can be lost; otherwise the company will back charge you, the hauler for the missing wood chips. You think to yourself; how is my dumpster business going to make any money! 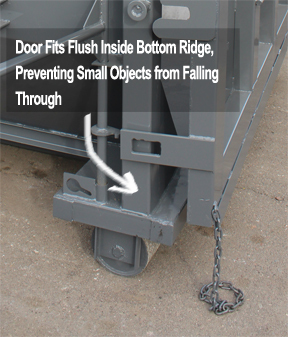 Our old roll-off dumpsters are built fine, but small objects are always escaping through the bottom of the dumpster where the door meets the back of the container. How are we going to contain all the wood chips all of the time? The answer is to buy a roll-off container that has a rear door that closes to fit inside of the end of the container. There will be a ridge to catch small objects from slipping through the cracks of the dumpster. Problem Solved! By buying the right Roll-Off dumpster, you will be ready to haul big and small objects without worrying that you are losing material. Hambicki’s specializes in making specialty roll-off dumpsters.